One of my study sites is a restored prairie, a particularly high quality one, but a bit small. Now this little prairie is being treatened by an invasive species, silky bush clover, an Asian relative of native bush clover. It's one of those things where the focus of your research was elsewhere, and when you finally become of aware of what is happening, it's too late. This week's field work, and probably next week too, will be to harvest the silky bush clover from our long term research quadrats to document its continued invasion and increasing density. How dismal. 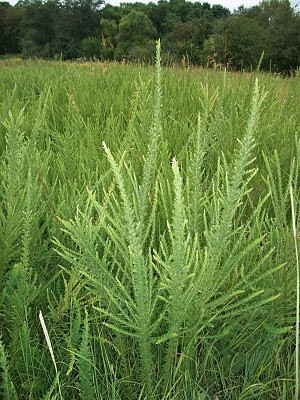 Because this invasive species is so well adapted to the prairie environment, no obvious mechanism exists for its removal, and this isn't just one or two plants here or there. So like good scientists the demise of this prairie will be recorded; it served us well for quite a number of years, but in another decade it will be quite a different plant community, one with dense stands of the clover, much lower species diversity, with some of the taller forbs, and the grasses persisting. Here's a view across a patch of silky bush clover and notice that you don't see much else except way back some grases mark the back edge. I'm not quite sure why a controlled burn can't be used? Natural? Yes! Effective? Yes! Dr Chips (wood not cow) asks: "Why a controlled burn can't be used?" Ah, would that it were so simple. This invasive legume is as well adapted to fire as the native prairie plants. However, like many prairie plants if flowers and fruits in the fall, but it seems to hang onto its fruits quite late so we're going to do a fall burn. That may slow the spread but won't get rid of the existing infestation. For that we may have try a "nuclear" option, herbicide, after we see how the prairie recovers (trials underway). Wow. Nasty. Every time I read an essay asking why we are so rigid as to reject the "enrichment" of our environment that non-native species represents . . . . Up here I've been involved with land conservation for a number of years, and to see our somewhat fragile marine/spruce/fir landscape disappear under a tsunami of Japanese buckwheat, taking native flora and fauna with it . . . Well, if you can nuke the stuff, go for it. Agreed, but a certain group of biologists, mostly trained as landscape ecologists, have been doing studies, like this one, that "refute" the idea that invasive species harm communities. Not sure where they are coming from except perhaps to make a name for themselves as nay-sayers. I'm positive you could find a species that benefits from the invasive clover, but that doesn't make it good for the prairie.